Downsizing with No Regrets. Start a new chapter with an active, community-centered lifestyle at Caliente Springs. The manufactured homes we offer an opportunity to live well without the burden of a mortgage. They also offer an environmentally responsible choice, with high-efficiency electronics and plenty of warmth and daylight from the sun, year-round. 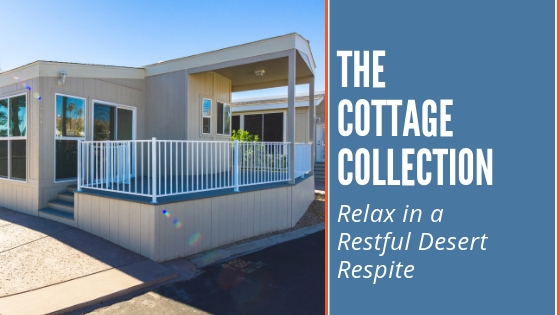 Homes in the Cottage Collection offer between 400 and 792 square feet of indoor living space, including an enclosed “sun patio,” great as a guest room, office space or living room filled with desert sunlight. Cottages in our collection allow ample room for social gatherings, but also can serve your quiet, contemplative evenings staring at the lively night sky. With the mountains as your backdrop and desert sunshine keeping you warm, the view will make you feel limitless. High Standard, Low-Maintenance Home Ownership. Our manufactured homes are carefully constructed and laid out to meet the demands of discerning homeowners. Each one comes standard with inclusions for convenience and functionality. The living room and bedroom contain TV-ready hook-ups; you’ll have a water line for a refrigerator and ice maker; and a 3-ton air conditioner with heat pump installation will prepare you for those hot summer days. The foundation of your cottage is stick-built on-site at the lot of your choosing, all to the construction standards of a traditional home. We also offer the option to expand your 10 x 16-square-foot patio to a 14 x 28-square-foot space, as well as customizing your flooring, window, cabinets and hardware inside the house. It’s all delivered to you move-in ready when you arrive. No hassles or headaches—just fantastic cottage living. Open-Door Community. At Caliente Springs Resort, we value social spaces, and offer community amenities ideal for making friends and staying active, like mineral hot spring pools and tubs, golf course and pickleball courts, chapel activities and community events. Residents and visitors can quickly get involved with friendly neighbors across the resorts in any of our public activities. Besides our own communities, we open our doors to interaction in the greater desert, with pickleball tournaments and volunteer efforts throughout the winter. The seasonal and weekend vacation and RV-ers who stay at our resorts often choose one as a place to settle down when they’re ready to get off the road. Desert Life in the Warmth of the Sun. When you are ready to step into your new Cottage Collection home, we’ll be ready for you. Starting at only $74,900, this collection will give you freedom, comfort and space that’s the perfect size to call home. Consult our sales team to see if this collection is right for you.